When using service-based clients, backups are executed by a service running in the background. The name of this service is Backup Monitor Service and is visible through the Services application in Control Panel. Like any other service on Windows, you can choose the user that is going to run that service. The default value for this user is the built-in SYSTEM account. Although the built-in SYSTEM user has access to every folder on the disk, these default permissions can be modified by the user. 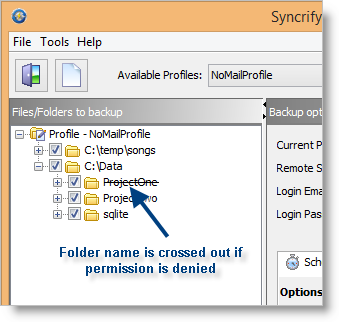 If for any reason, the user that runs the service is denied access to any folder or file, Syncrify will not be able to backup those objects. One way to fix this problem is to grant read permission for every file to the SYSTEM account. How do you know if there is a permission problem? These errors typically appears in the log files on the client machine. Starting from build 828, the Syncrify client can display files and folders with a line through their names if a particular folder cannot be accessed from the service running in the background. Check the log on the client machine to see the exact error message. 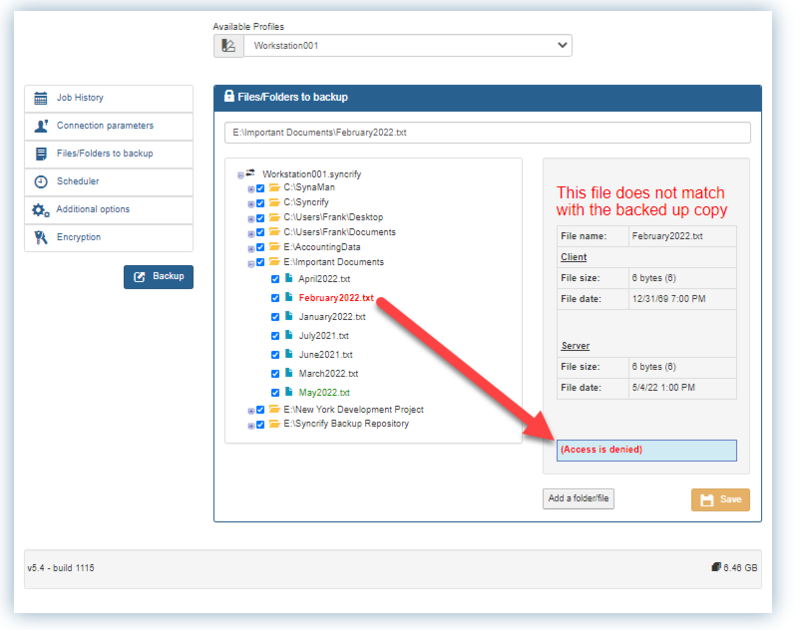 Note that if a file is locked by another process, Syncrify will report that it is inaccessible, however, when Backup Locked File option is checked, Syncrify will still be able to backup these files. The following images display screenshots showing an inaccessible file or folder.